Comments: The small, diversified farms common in the early to mid-1900s favored the eastern spotted skunk. These farms often had poultry, corncribs, brushy fencerows and haystacks making it easy for the eastern spotted skunk to find mice, eggs, fruit, grain or carrion. This skunk is adept at climbing trees and some old farmers refer to it as the civet cat. Agriculture has changed dramatically, and small farms have nearly vanished along with the eastern spotted skunk. Pesticides like DDT may have also played a role in the long-term decline of this mammal. Even though the striped skunk is common, the eastern spotted is rarely seen. 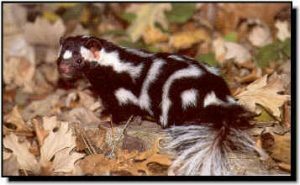 Its black tail with a white tip, elongated white spots on its back, and white spot on its forehead distinguish it from the striped skunk.